Okay, after I warmed up to the idea of Link (I still think it's a crazy idea, but now I know it was made because of the anime and that all mechanics actually come from the anime) and thanks to both a crazy dream doing homage in a way to the first episode ever of Yu-Gi-Oh! Duel Monsters as well as some other of my favorites from that era, I designed a brand new mechanic. It's a crazy mechanic, but I got it from translating a dream to real life (so, if it works, hold on your horses, Konami). Anyway, let's get upgraded, people. 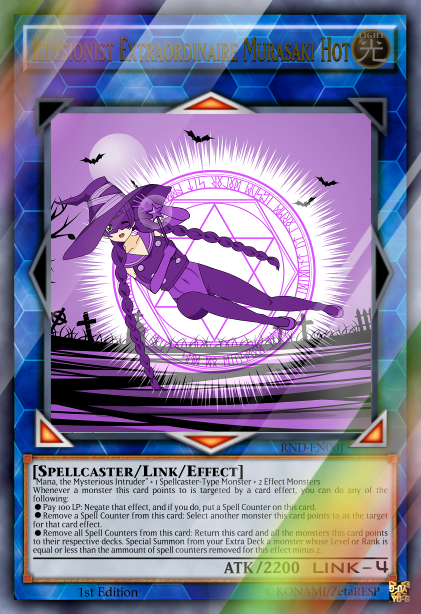 A Link Monster counterpart from the main deck is on the way. As I said, it came from a dream. I was dreaming an episode with a lot of drama. In one moment, the main character, a jumper wearing small fry named Yuu Kaido (who, unlike 15-yo Yugi, is actually a small kid), who was facing a Kaiba knock off called Frederic Star, draws a card he never had in his deck and had never seen before, at the same time a wind blows his hair forward giving him a more YGO Main Character cut (funny scene related to it), and he decided to play it with inspiration from the whole scene. As everybody else called shenanigans and cheating, an AI that was the acting judge shone some light on it, allowing it to be played and thus his victory came. And with that, I woke up. I got that dream, stronger and stronger, the entire week. Now, with the thanks to Discord User 345boneshoss#8427, I got to make the template of these cards in the proper way (as well as a kind of rough draft of the actual card that was used . A Terminal Monster is a type of Monster card originated from the main deck. It can either be a Normal or an Effect Monster and it has the same background color as those, but its frame has an overlay of black and white circuitry lines. The art had been extended and the text boxes have a layout similar to the Pendulum Monster boxes, with the set number located in the ATK/DEF line as well, but with a different form to showcase both the Terminal Effect and the Download Effect. Like with Link Monsters, these cards have arrows called "Gate Arrows" that are cyan colored rather than red coming from the now extended art box, no stars to indicate their level/rank, which they lack of, and the ATK/DEF line has no DEF in it, instead having a "GATE" label with the card's Gate Rating. First than all, it doesn't require a sacrifice, but rather an equilibrium: Any player can do a "Terminal Summon" at any time during their Main Phase as long as the total Gate Rating in the field remains equal or lower to the total Link Rating in the field at all moments. This is known as the "Link/Gate Balance"
Example: If the opponent has Decode Talker and Firewall Dragon and you have Link Spider, then the total Gate Rating is 8 and there could be summoned, for example, two Gate-4 Terminal Monsters. In case the total Link Rating is lowered by monster removal or other effect, the Terminal Monsters will be sent to graveyard at the end of that phase starting with the player with the highest Gate Rating total in his side of the field starting first. This is a condition of the summon and cannot be avoided. Example: There's a total Link Rating of 9 in the field and a Gate Rating of 7 split in one Gate-4 Terminal monster in one side and a Gate-2 and a Gate-1 Terminal monster. 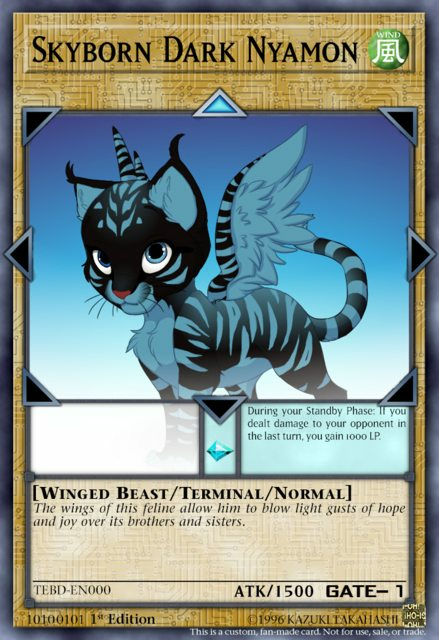 If one of the Link Monsters were to leave the field and lower the total Link Rating to 6, then the Gate-4 Terminal monster would leave, as it's the only Terminal Monster of the player with the highest total Cate Rating on play. and Download Effects, that are effects the Terminal Monster grants to any Link Monster it's pointing to and that remain on said monster while it's on the field (hence the name Download Effect). 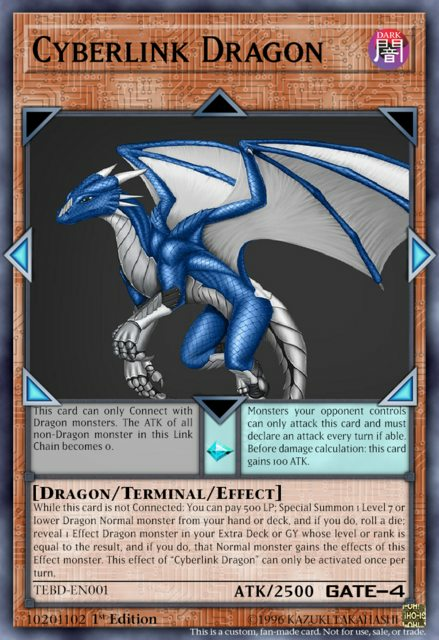 Normal Terminal Monsters, just as Normal Pendulum Monsters, are considered Normal Monsters in regards to effects from other cards. Effect Terminal Monsters are also considered Effect Monsters in the same regards. However, it should be noted that effects that special summon Normal Monsters would deal with the limitation of Link/Gate Balance at the end of that phase. Terminal Monsters have a "Gate Rating", which is like a counter-Link Rating and, just like its counterpart's, it's equal to the amount of Gate Arrows it has. These arrows are basically to work around the Download Effect. As mentioned before, this is what bases the Terminal Summon, as the total Gate Rating on the entire field must be equal or lower as the total Link Rating in the field. If a Terminal Monster is summoned to a zone a Link Monster points to and it also points to that Link Monster, both monsters become "Connected". The network of linked zones formed by the Link Monsters and the Linked Monster is called a "Link Chain". I would like to hear your critiques and any advice you have to perfect them (it's an archetype featured in a dream, any help is welcomed). EDIT: Given the fact there are Terminal Arrows aiming down, I'll add a corollary: Terminal Monsters can be summoned in the ED Zones. However, that's a risk in itself, because it would leave the player without the ability to summon from the Extra Deck. After being bummed by the lack of critique on my other cards, I decided to give it a try to another idea I just got and make it as complete as possible from the get-go. The Psy-Factor is an archetype composed solely of Psychic monsters and whose support is on Psy-Counters, markers that trigger multiple effects on the rest of the cards. Unlike other archetypes based on counters, the idea on this one is to make more of them be on the field and trigger a wide variety of effects. The main deck is currently made of 7 Level 4 Monster and a Level 5 Monster, as well as some traps and spells. When a monster you control would be destroyed by battle or card effects from an opponent's card: Remove 1 Psy-Counter per Level on that monster you control (min. 1) and negate that attack or effect, and if you do, destroy that card. During your End Phase: you can pay 400 LP; target a monster card with counters on it and put on this card the same amount and type of counters on that card. This effect of "Psy-Factor Caretaker" can only be activated once per turn. This card gains 100 ATK for each Psy-Counter on monsters you control. Once per turn: If this monster destroys an opponent monster by battle, put a Psy-Counter on it; it can attack one more time in a row. During your Standby Phase: You can Special Summon this card from your hand; It loses 1000 ATK and DEF until the end of turn. Cannot be destroyed by battle nor targeted by card effects your opponent controls. If this card battles a monster: Take control of that target at the end of the Damage Step and equip this card to it, then put a Psy-Counter on this card. Control of monsters equipped with this card cannot change. If the equipped monster would be destroyed: Special Summon this card and roll a die for every Psy-Counter on this card; That monster's owner loses 1000 LP x the total result of the roll. *This card gains 200 ATK x Psy-Counter on the field until your next turn. It deals piercing damage. *This card gains 200 DEF x Psy-Counter on the field until your next turn. It cannot be destroyed by card effects. Once per turn: You can remove 1 Psy-Counter from your field: Reveal one Set card on your opponent's field, then flip a coin; if it's heads, destroy the revealed card; if it's tails, put a Psy-Counter on this card. Once per Turn (Quick Effect): Remove 3 Psy-Counters from the field; Target a Spell Card in any graveyard; you can activate the effect of that Spell until the end of your turn. Whenever you equip a card to this card: put a Psy-Counter on that card. If an opponent were to Special Summon a monster by a card effect: you can remove a Psy-Counter from your field for every Level, Rank or Rating on the summoned monster; negate that monster's summon, and if you do, you gain 100 LP for every Psy-Counter removed by this card's effect. *When this card battles, remove a Psy-Counter from it. *Once per turn: Remove a Psy-Counter from this card; this card gains 500 ATK until the end of turn. *If this card has no Psy-Counters on it, destroy it. *Remove 1 Psy-Counter from this card: negate that effect, and if you do, return that card to it's owner hand. *Remove 3 Psy-Counters from this card; negate that effect, and if you do, banish that card. Activate only if you control 2 or more "Psy-Factor" monsters: "Psy-Factor" monsters you control gains half the combined attack of every other "Psy-Factor" monster you control while this card is in the field. During your Stand-By Phase: you can pay 500 LP or destroy this card. If you have 1 or more "Psy-Factor" monster(s) on your field: Special Summon a "Psy-Factor" monster from your deck with a name other than the "Psy-Factor" monster(s) in your field. Equip only to a Psychic monster. The equipped monster gets 200 ATK per Psy-Counter on this card. Whenever equipped monster destroys a monster: put a Psy-Counter on this card. Remove all Psy-Counters from this card: the equipped monster can attack directly this turn; at the end of the turn, shuffle this card into your deck. If a monster would be Special Summoned by an effect other than its own while you control a "Psy-Factor" monster; negate that Special Summon, and if you do, remove from play all the cards involved in that summon and put a Psy-Counter on a card you control for every card removed from play in this way. If a "Psy-Factor" monster you control is targeted for an attack, you can remove as many Psy-Counters from your field as you want; that monster you control gains 200 ATK and DEF for every Psy-Counter removed this way until the end of turn. This set still has a lot to grow, so I will accept any critic and guide you have about it. Once per turn, during your Main Phase 1: select a set Trap Card you control; treat it as a Spell Card and activate it; change this card to Face-down Attack Position. If this card is in face-down Attack Position during Main Phase 2: You gain 400 LP. FLIP: you can target a Tuner monster you control and a non-Tuner monster your opponent controls: Synchro Summon a Synchro Monster of the same attribute from the first target whose level is the same or lower than the combined level of both targets; banish both targets rather than send them to the graveyard; both players gain LP equal to half the ATK of the Synchro Summoned monster. Every monster in the field loses 2 levels. When a card effect would inflict damage to your LP: you can target a monster you control; said target's ATK and DEF become 0 for the rest of the turn. When a monster you control is destroyed in battle: you can target the attacking monster; summon a Level 4 or lower monster of the same attribute; increase the ATK of the summoned monster by half the ATK of the destroyed monster. I'm open to any suggestions. ANY. This is my idea: An archetype that's mainly Pendulums and Links. I know it won't work with the new type of duels that appeared, as those don't admit Pendulums, but that's how I got in the game. So, the thing would be that the Pendulums evolve into Links, i.e., the Pendulums are each a required Material to Link Summon the Link Monsters. The Pendulums are all Lv 4 and the Links are all LINK-4. Also, all Links require [Pendulum Monster]+[1 monster from the type]+[2 effect Monsters], because why not. Examples below. Pay 100 LP: Negate that effect, and if you do, put a Spell Counter on this card. Remove a Spell Counter from this card: Select another monster this card points to as the target for that card effect. 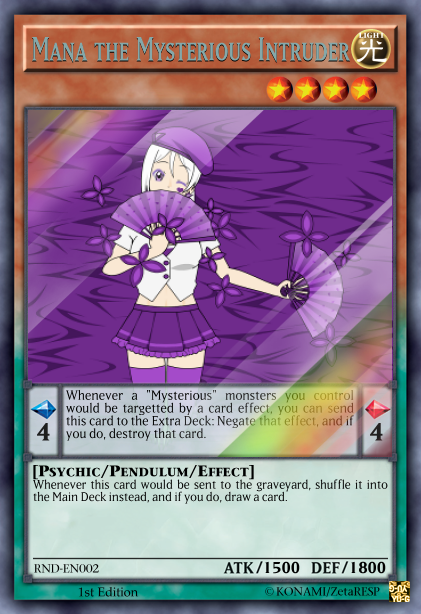 Whenever a "Mysterious" monster you control would be targetted by a card effect, you can send this card to the Extra Deck: Negate that effect, and if you do, destroy that card. Whenever this card would be sent to the graveyard, shuffle it into the Main Deck instead, and if you do, draw a card. After some thinking and the fact my brain can't work properly as of lately, I decided to post the only deck where I got to win so far, albeit by accident. About the win, it came down to delay the thing as much as I could until I played Gravity and his effect caused my enemy to kill himself. I'm not convinced this deck is good at all, dunno how to improve it (although I'm trying) and it's a deck that saw some changes due to advice from a lot of people and my lack of money/access to some cards. I will try get back in action somehow, probably getting a better deck. I also have to define how will I play, likely I make it closer to an Odd-Eyes with Draco/Magician/Performapal Support. I have a second Deck formation I was trying, adding a side deck in case I need it (I DO!) and all that, but I dunno... what do you think, people?